Awaiting a liver transplant, a local fixture rediscovers music. The artwork on the CD for Bob Smith's new band Mountains is individually hand-made, down to the stain of a coffee cup. It's a symbol of the energy with which this dynamo of a drummer approaches music. Smith has been a prolific presence in the local music scene for years, and had a hand in a number of memorable recordings like Thirsty Alley's 1995 CD American Studies, which sounds a bit like what would happen if Steely Dan played punk rock, with Stephen Malkmus' sarcastic snarl thrown in. Local music fans took note, and the band won City Weekly's North by Northwest competition in 2007. He had taken a few years off playing music, just to take a much-needed break, but last year he felt the urge to get back behind the drum kit again. The Irish band Dunmore Lasses got him back into drumming, but a recent diagnosis of liver disease, and waiting on a transplant list, added some urgency to his muse. "My recent creativity comes from that," he says, "I don't take anything for granted. I have a re-found love for music, and I'm grateful for every gig." As an example of his wide-ranging musical aptitude, the first time I met with him for this article, he had just played with the Salt Lake Symphony; the second was right before jamming at the traditional Irish session at the Republican. But his current focus, if you can use that word to describe this peripatetic percussionist, is the self-titled four song Mountains EP. The band has only been a band since mid-summer, a quartet including long-time local sax phenom Phil Miller, 20-something newcomer guitarist Jacob Dahlberg, and the enigmatic Geed on bass. Mountains' CD release was last October at Fats Grill, which recently closed. It is truly fitting that the closing party for the well-loved watering hole last December featured Smith, who had played there under the flag of so many bands over the years. Smith has been including a CD of the show at Fats with the studio disc, but the live one is in limited supply. It includes covers of the Grateful Dead's "Franklin Tower," and an incandescent Phil Miller vocal on Waylon Jennings' "Not Hank's Way." A couple other things make the release remarkable: Mountains was recorded live, without overdubs (except vocals and saxophone), at the legendary Herc's Living Room, a studio set up literally in veteran local producer Herc Ottenheimer's living room, which has given birth to a lot of great recordings over the years. The producer gave the set a wonderful warmth and flow that entices you to listen all the way through. Also, Mountains may be an EP, but it's over 30 minutes long. The three Smith originals and Dahlberg's "Bird In Flight" work their way into your head little by little, and tend to stick. Smith's lyrics observe social foibles, and "Regrettable Past" is the most personal: "I'm living the future of a regrettable past. This is who I am," he sings. 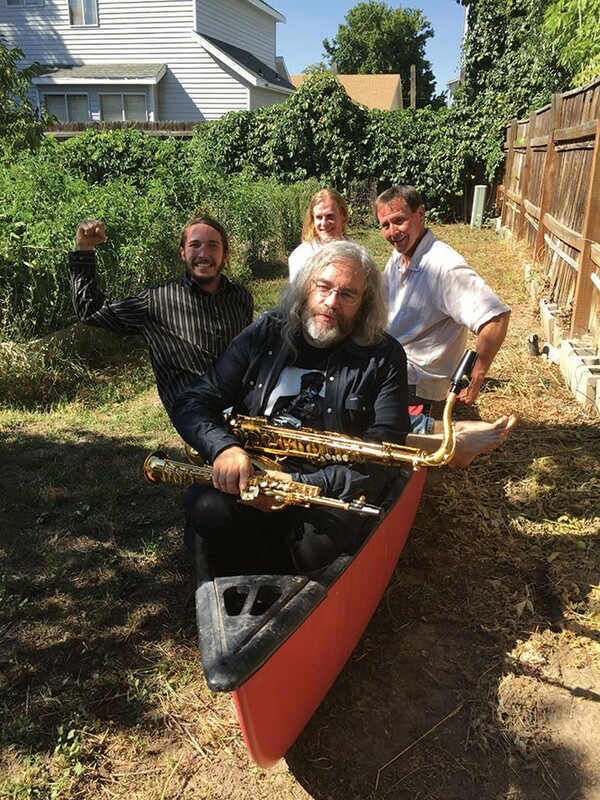 "Bird In Flight" lets Dahlberg's playing take to the wing—jazz-tinged, extraordinarily clean and articulate. Not one to be reticent, Smith says he takes a solo on every song. If being involved in Mountains and Dunmore Lasses wasn't enough, Smith also plays with jam band Gorgeous Gourds (which includes former City Weekly photographer Fred Hayes), Juana Ghani side project Orphans Cabaret, and experimental rock group Watches, which will record soon. Flitting from one project to the next, you might mistakenly think Smith would be a bit frantic. "This band is about taking our time," he observes, "developing the idea of what it will become." The tranquility of their playing is a great strength, concealing the energy of their collective imagination. "There's no hurry," he continues. "When we're playing it's, like, we have all day long to play this song."